If you managed to snag a HP TouchPad for $99, you’ll want to get the most out of your bargain tablet. 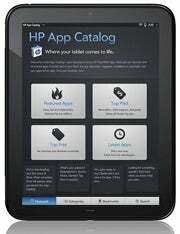 The HP App Catalog is one of the smallest out there, but it’s where you’ll want to go for the few good apps, and best of all--free apps--to keep you entertained until hackers port Android 3.0 on the TouchPad. As a side note to the list below, you may notice that no links are provided to the apps I suggest here. That's because HP does not offer any direct links to specific apps. That means if you're not reading this on a WebOS phone or tablet, that give you direct access to HP's app catalog, you'll need to visit HP's Web-based apps store to browse apps. Let's look at 10 interesting WebOS apps that won't cost you a penny. The WebOS Facebook app is an elegant way to keep in touch with your friends. The free app supports Facebook messaging, news feed, a list of upcoming events, and features HP webOS notifications. You can also upload photos taken with the built-in camera directly to Facebook. Spaz is a full-featured three-column, multiple-accounts Twitter client for TouchPads which performs just as well as its paid competitors. The free app currently lacks support for lists and Exhibition mode. The TouchPad can make a bargain mobile blogging machine with the free Wordpress app featuring an elegant sliding panels interface. You can write and edit posts, moderate comments and there’s support for multiple blogs too. Foodies have a refuge in the free Epicurious app, which lets you find recipes based on category or specific ingredients. You can also add all the ingredients of a dish to a shopping list, for when you take the TouchPad shopping with you. If your work place uses Citrix to host applications, you can use this free TouchPad app check your email, review documents, tune into project dashboards, and approve expenses. The free Kindle for TouchPad app allows you access and read books you have downloaded from the Amazon Kindle store, as well as shop from the extensive library available. You can listen live to around 50,000 radio stations from across the world with the free TuneIn Radio for TouchPad. You can search stations from your area or go global and search for stations by topic. WeatherBug presents you with a virtual open window with a recent picture of your location. Besides this nifty detail, you get the usual weather forecasts, radar images and wind speed and direction, all for free. Yes, the addictive world-famous game is free on a TouchPad. If you want to go beyond the free levels included, there’s always Angry Birds Rio HD ($1.99). It's unclear how many new tablet apps might be in the works for the TouchPad - if any. HP has a note on its app section of its site that states: "Thousands now. Bazillions on the way... Find them all in the new HP webOS App Catalog." HP then offers a link to a "Notify me when available" link for its app catalog. In light of recent events HP is probably not planning on releasing "bazillions" of apps anytime soon. But I think there is a good chance some new WebOS apps may surface - they just might not be tablet optimized. My reasoning for this is, WebOS isn't dead (despite repeated reports of its death) and HP's Pre 3 handset that runs the WebOS mobile OS will go on sale later this year in Europe (but not here in the U.S.). While most mobile app developers are jumping from the WebOS ship and headed for Android, according to reports, some WebOS app development will continue as long as HP is marketing and selling the Pre 3, I predict. That is until the final nail is pounded into the WebOS coffin.